Vlaams Belang, a Belgian far-right party, launched a website today (10 April) that invites people to report crimes committed by illegal immigrants, mirroring a similar site in the Netherlands set up by the far-right Freedom Party. The website meldpuntillegaliteit.be created by Vlaams Belang (Flemish Interest) invites people to file anonymous tips about social security fraud, work on the black market and more serious crimes, a move anti-racism activists compared to Nazi tactics. 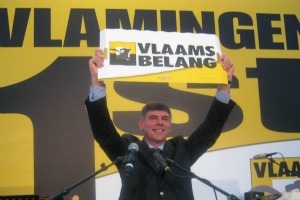 Vlaams Belang was previously known as Vlaams Blok, but the political force had to change its name in 2004 after Belgium's Court of Cassation found it in violation of the law against racism. Vlaams Belang has 12 seats in the Belgium Parliament's lower chamber and five senators, but suffers from competition from the separatist New Flemish Alliance (N-VA). N-VA was the leading vote-getter in Belgium's Flemish-speaking region in the June 2010 national elections, but was isolated from the present governing coalition led by Socialist Prime Minister Elio Di Rupo. Filip Dewinter, the Vlaams Belang leader, defended the website because of the presence of "tens of thousands of illegal immigrants" in Belgian cities and the problems stemming from them. He added that the data reported would be sent to the police. Jozef De Witte, director of the Centre for Equality and Struggle Against Racism, told Belgium's Radio 1 that the website is reminiscent of measures taken by the Nazis in the 1930s or the East German secret police during the Cold War. "This is completely illegal. Mr Dewinter knows this very well. He wants to shock and provoke," De Witte said. The Dutch Freedom Party (PVV) created a similar website, titled "Report Middle and Eastern Europeans," asking people to provide information about "nuisance" associated with migrant workers or those who lost jobs to them (see background). The European Parliament has called the website "deplorable" and pressed Prime Minister Mark Rutte to distance himself from it. The Dutch parliament voted last month to denounce the website, but Rutte, whose majority in the 150-seat lower house requires support from the PVV's 23 lawmakers, has declined to condemn it. The right-wing Dutch Freedom Party (PVV) launched a special website on 10 February, inviting Dutch citizens to denounce nuisance caused by Europeans citizens coming from Poland, Romania and Bulgaria [more]. Types of nuisances that can be reported include pollution, problems related to housing or simply competition on the job market. More than 10,000 of people responded in just a few days. The PVV website caused a stir in the countries concerned. Viviane Reding, European Commission vice president responsible for Justice, Fundamental Rights and Citizenship, vigorously condemned the website for "openly calling for people to be intolerant". On 15 March, the European Parliament the website and asked the Prime Minister Mark Rutte to distance himself from it. PVV, led by Geert Wilders, is the third largest party in the Netherlands. Although it is not in the government coalition, PVV has been an active supporter of Rutte's conservative cabinet, a cooperation which was laid down in a "support agreement". RTBF Info, Belgium: Délation: le Vlaams Belang ouvre un site pour dénoncer les "illégaux"